It's 2014! I have to admit I didn't have the most exciting New Year's ever -- my flight was delayed so I ended up spending NYE on a plane, with *gasp* naked nails. Well, I guess worse things have happened. Anyways, I felt like I was missing out on the whole festive New Year's partying thing, so I did some belated New Year's nails! I wanted to be able to wear these around for the rest of the week without feeling stupid, so I decided against writing a big "2014!!" on my nails. Instead, I opted for a glitter gradient with Deborah Lippmann Fantastic Voyage (the glitter, of the Starlight collection) and Nails Inc Baker Street (the blue base). I guess it would be acceptable for me to do a 2013 roundup sort of thing, but I've only been blogging since August so I'll make it really short. 2. Started this blog in August! 4. Built a lightbox which improved my photography so much you won't even..
Deformed zombie-like hands. And the cuticles -- gross! In other news, I redesigned my blog yesterday (I'm honestly ready to kill Blogger now) and I'm really happy with the new design! What do you guys think? Anyways. This is becoming a super long post so I'll stop now! I love that shade of blue! The new blog the design is so perfect! Love the new look :) Great colour scheme! And the little snail is fabulous. 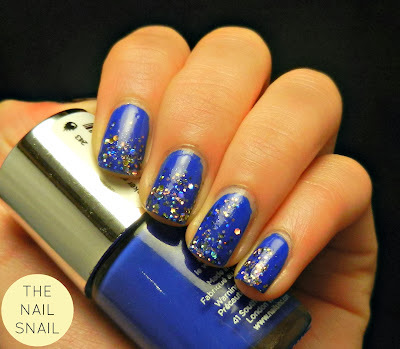 That glitter is fantastic against that blue, love this combo. Hope you're having a great 2014 so far! Ha ha...I love your comment "worst thing about it was not being able to do NYE nails"...sounds like something I would say. Haha -- bare nails, y u so weak?? I feel lucky, I managed to keep all my naked nails unbroken while lugging stuff all around the airport! Love the designs you made! Love, love this. I'm such a sucker for blue mani's and Baker St. is one of my favorites. I really love your blog design :) Were the tab link things always anchored at the top? I reallllly like that! Thanks! It was, but there's always next year ;) You too! Well, it's still holiday season :) Same to you!